There are very few books that capture the whole essence of the war going on in Iraq--with all the tribal, religious, historical and cultural divisions that plague the country. "Saving Babylon" is a whole new and most refreshing look at that war and the people who serve there. It will not only open your eyes and your mind but it will also open your heart. The author found a purpose much higher than just conducting war; he tried to make a difference in the lives of those he met there. To that end he was successful! Author Paul Holton (Better known by many around the world as "Chief Wiggles") writes a memoir of his tour of duty in Iraq, as an interrogator for the U.S. Army, which gives the reader a real inside look at what was and is going on there. He writes about the captured generals that he personally spent months interrogating. More importantly, is the way he does it. As a former soldier, I was pleased to read how Chief Warrant Officer Holton, made it a point to uphold the principles of "The Geneva Conventions of War." He used his personality--not torture or cruel punishments (as we have read so much about in the media) to extract information from POWs. He approached his job as a professional with a humanitarian heart and not just with the POWs but with the children of the country. The book is a wonderful read for men, women and even for mature children. It is on the MWSA "Top Ten Recommended Reading List" for 2005. The Military Writer's Society of America recognizes Paul Holton's efforts with their "Humanitarian Award for 2005". Author James Finnegan has followed his other great book " The Sage of a Student Warrior" with a continuation of his warrior's -James Callaghan - adventures. This time, we are taken to Vietnam where the young Lieutenant finds himself in the heart of South Vietnam - Saigon; and deep in war. The story is only fiction - but you become involved with the story, just as if it were happening to yourself. Well told tale - and well worth reading. Saving Babylon is the gripping account of an Army interrogator in the Iraq War. Holton’s techniques, honed over 34 years, got him inside the hearts of Iraqis. He dealt with the best and the worst of Iraqi society on a daily basis. He interrogated Iraqi generals, judges, political candidates, POWs and common crooks. He saw freedom take root. Holton saw more good being done than the media has ever published or broadcast. It’s time Americans read that side of the story. 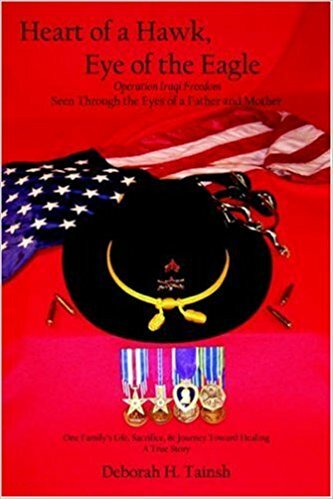 Having lost my own step-son, I can share the pain and emptiness that the author, Deborah Tainsh and her family have and are experiencing over the loss of her step-son, Sgt. Patrick Tainsh. Though the depth of that loss is common between us, there is great comfort to be found in knowing your child died a hero. Heart of a Hawk, Eye of an Eagle, takes you through one family’s memories of love and heartache, of a their son Patrick’s struggle for self identity, acceptance and purpose. Deborah takes the reader on her family’s journey through the grieving cycle when they learn of Patrick’s death in Iraq. Share their pain as they go through the denial and anger and experience the effects it has one the family. Cry with them as they each learn how to release that anger and begin to accept their loss. Heart of a Hawk, Eye of an Eagle, is a book that should be embraced by every military family! To offer comfort to those who have also lost someone to war, to offer insight to those who face this possibility every day – will they be the next to receive that knock. t should be read by every agency wanting to provide support to military families and by those in the community who want to gain a better understanding of military life and the sacrifices that come with it. Be prepared to cry. Be prepared to learn. Be prepared to change. It is this reader’s prayer that Deborah and Dave can continue to grow together and one day be able to share the joy of who Patrick was, to take pride in sharing his life’s journey and the stories – good and bad that made him the hero he was! **Note: Deborah has arranged that a percentage of every book sold will go to support TAPS, Tragedy Assistance Program for Survivors. David and Deborah Tainsh were living the happiest years of their lives until the dark morning of February 12, 2004, when a six a.m. knock at the door brought the news that their son, Sergeant Patrick Tainsh, had been killed in Iraq. Patrick, David’s only child, was the pride of his life. He was the son who overcame a rebellious, drug-addicted youth to become an outstanding U.S. Army Cavalry Scout, posthumously awarded the Bronze and Silver Stars for saving the lives of his commanding officer and other soldiers before succumbing to his own wounds. In the wake of their loss, David and Deborah battle horrific grief and anger while trying to hold their marriage—and one another—together in an unforgettable journey toward healing. Sometimes I come across people who really impress me with their endearing spiritual life purpose—composer, musician, singer, Susan Wiseman is one of those special souls. Her “FREE CD” that she gives away to veterans and their families is entitled, “It is the Soldier” It is a true creative labor of love; a gift for the heart and the spirit if there ever was one. I sat mesmerized listening to it the morning that I wrote this review. It was raining outside and overcast with dark clouds with thunder pounding in the background—yet, in my room where I was listening to her music, it was all sunshine and brightness. She has created a heart rendering patriotic recording that reflects love and hope and spiritual values. This is a CD that she could charge $20 for and you would be getting more than your money’s worth but she is determined to “gift” others with her ministry of music. The music is kind of new age in the best sense but it is also something else that is hard to put your finger on. I tried all morning to figure it out until I went to her wonderful website and realized that what I was trying to figure out was called LOVE. This CD is nothing but pure LOVE and that is what makes this music so special. She honors veterans with her words and music but every patriotic American will find this CD to be moving and entertaining. Who’ll say… “goodbye”… to me, today. Or, the little GI Joe… he used to play. That I… have come to see. Make him… ALL… he needs to be. That must face… the unknown. Who… may not be… coming home. To stand… beneath… this Flag. And, makes this nation… Proud! Not… the boy… he used to be. Make him… ALL… that he… can be! Anywhere… if… You’re not there. He is loved… and, we’re… So PROUD! Into the battle… of defeat. Be it… ONLY… to his knees. That keeps… this Nation… FREE. Far… as the eye… can see. It is… “The Soldier”… yet… to be. To… the LAND… OF… THE… FREE! While author Larry Michalove was flying missions in Vietnam earning himself two Distinguished Flying Crosses and eight Air Medals, he was thinking about his family. In his letters home he began to write a long series of stories for his children using them as the central characters in the unfolding story. His book is an accumulation of all those stories from his letters back during the Vietnam War. They are rich in imagination and of course, love! When I was reading the beginning of the book I could not help but think how wonderful for his children to have these stories saved for them in a book form. But in truth, it is also really great and wonderful for all us as well. These precious stories are great bedtime stories to be read to young children. The author’s literary journey took his children far away from the worries of the war and into the world of pirates, mermaids, moon people, and lots of magic. This is family fun and joy filled reading and should be shared with the young members of your family. I fully recommend this book for all young and young at heart readers! Have you ever ridden on a magic carpet or tamed a cage full of savage beasts from the darkest jungles of Africa? Adventurous siblings Lisa, David, Stacy, and Karen Michalove have! Under the care of a jolly elf, the Michalove children go on fanciful journeys among the stars, under the sea, to the North Pole, and to many other unusual, fascinating places. They encounter talking ants and farm animals, dancing pumpkins, and green cheese-eating Martians. But no matter where they go or who they meet, from the darkest recesses of a cave to the farthest reaches of the moon, Lisa, David, Stacy, and Karen always return to the comforts of home and family. 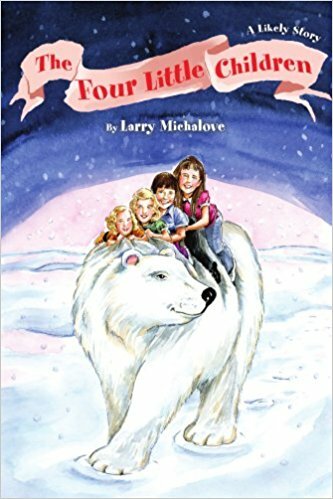 These treasured stories, originally written to connect a father at war in Vietnam with his four kids back home in America, will inspire children to expand their imaginations while learning important lessons about love, respect, and responsibility. Encouraging a unique closeness between parents and their children, this read-aloud collection will whisk families away on truly fantastic adventures. The story that has not been told - Until Now! When I went off to the Vietnam War back in 1967, not many of us were career soldiers—most of us were draftees, or just doing our enlistments. We all wanted to get the hell out of the service as fast as we could. We were mostly single men. The vast majority of us did not deploy as a unit but went as individual replacements. For those of us who had spouses and children they would find a world with no support systems in place. These families would become isolated in various parts of the country. I honestly never gave any deep thoughts to what it was like back in the states for those families left behind, or for those who were married with children. Author Jessica Redmond paints a vivid picture of what was never talked about or seen by most of us old veterans (or the public) in her riveting account of those left behind by their spouses deployed to Iraq. Her book “A Year Of Absence – Six women’s stories of courage, hope, and love” was an eye and heart opener for me. She gives us an insider view of what life is like for those family members who have to survive and carry on without their spouses for a year. Her book is a well written chronicle of the intimate lives of six women left behind on a US Army base in Baumholder, Germany. Her women soon discover how little the government can really do to help them and they soon realize that they have to take care of each other. They face all the normal family issues plus the added stresses of having their loved ones thousands of miles away in a combat zone. Jessica captures the feelings and the emotions and the reality of the life they faced. It is a hard honest look at what their lives were like for one year. You cannot help but be captivated by their stories. I think, as the title implies, these women’s stories were about love and courage and so much more. This book should be required reading for all spouses of military personnel. Military life is not easy in an all volunteer Army (or any of the services) and those marriages that do manage to survive until retirement certainly have something special going for them. This book is a look at how these women handled things and how they felt. It spares us little—all of their emotions are opened up to view; the fears, the depression and even the joy of reunions. It is not an easy life and this book exposes that truth for all to see. The book itself is very well written and structured so that readers can follow along on this year long journey as if you are a member of the family. One of the best written accounts on the social impact of modern war; a must read book! Given the MWSA HIGHEST RATING - FIVE STARS! A Year of Absence follows the lives of six women whose husbands, all members of the U.S. Army’s First Armored Division based in Germany, deploy to Iraq in April 2003. A young lieutenant’s wife comes dangerously close to alcoholism. Marriages are pushed to the breaking point by the constant strain of fifteen months apart. Each morning the women anxiously scan the headlines, wondering if they still have a husband, if their children still have a father. Some form friendships that become their lifeline. Others somehow find courage despite their isolation. Through tearful goodbyes, long-awaited communication from the front, and joyful yet troubled reunions, A Year of Absence captures what life is like for many families of deployed soldiers: the ever-present fear of death, the pressures of single-parenthood, and the strength and comfort that come with the support of close friends. Book excerpt Jena was strolling home from walking the dog when she noticed an official U.S. Army car carrying two soldiers in Class A uniforms heading toward her street. She felt her pulse quicken and, without meaning to, she started doing the math. If the soldiers stopped at her building, there was a one-in-twenty-four chance that Adam was dead. If they stopped at her stairwell, it was one-in-eight. Don’t come down here, she prayed silently. Please let it be somebody else. Brilliant Memoir of a USMC Officer at War with Terrorism Author Nathaniel Fick, a former USMC captain with the First Reconnaissance Battalion, writes a tell-it-like-it-is memoir in his book: “One Bullet Away – The Making of a Marine Officer.” It is a compelling and riveting insider's look at the recruitment, training and making of a Marine Corps officer that takes us right into the combat and the action. Fick goes from the Ivy League halls of Dartmouth to the hard and courageous life of a reconnaissance officer in the Global War on Terrorism in Afghanistan and Iraq. His story gives us one of the best insider looks at what is happening in our war on terror. It is written from the point of view of one of those few brave young men who are leading the charge and risking their lives daily. This book is highly readable and is destined to become a 21st century classic of how we fought this new kind of war. It is also not shy about pointing out the stupidity of some of our commanders and those in charge. He pulls no punches and holds nothing back in his analysis of what happened. This book shows the best and the worst of people. It is honest prose that evokes the essence of older more classic war literature—when courage and compassion were still important to our fellow countrymen. Once you read this book you will be affected in some way. Your emotions and your thinking about the war and how it is being handled will change. You will also have a much higher regard and respect for those men and women who are serving our country in this war now. A Must Have Guide for All Military Families! There are some books that you need to make a go of your life—the Bible for some, a first-aid book for others, a how to fix everything in your life “For Dummies” book for most of the rest of us. 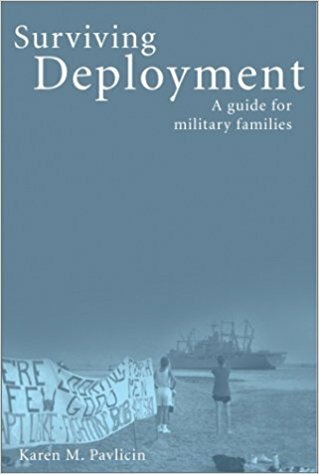 However, if you are a military family, then Karen Pavlicin’s book “Surviving Deployment – A guide for military families” is your survival book and should be on the top of the list. This is like taking a course in “Military Family 101A” without any college credits and no tuition. This is the best book of its kind out there and one that should become a tool that all military families should have close at hand. There is so much great advice and information. With this book you can take a lot of the anxiety and fear out of going through any deployment. This book gives you that kind of emotional support and practical wisdom. There are also personal stories from many families and checklists that are “real world” helpful! It is well written and easy to read. It covers so many areas and subjects from how to handle finances to problems with your children. There is not much ground that the author does not cover and relate to in some way. Reading this book can reduce the stress levels associated with military deployments through knowledge and education. As part of today's active duty or reserve forces, your loved one may be called to war, peacekeeping missions, anti-terrorism campaigns, field exercises, disaster relief, and many other duties far from home--and you. Surviving Deployment is your personal guide to turning an otherwise lonely and challenging situation into a positive experience. Learn what to expect, how to prepare, and how to personally grow as individuals and families. Your survival gear will range from a sturdy toilet plunger to the fine art of letter writing. You'll manage financial changes, help children express their feelings, and discover a renewed appreciation for everyday life. Solid information. Practical checklists. Personal stories from hundreds of families. Poet-Warriors have always gone off to fight the wars since the beginning of time. The old tradition of taking emotional and spiritual inner photos of what they experienced and felt so they could record them in poetry latter on, is still carried on by one of the most prolific of Vietnam poets. Kerry “Doc” Pardue in his first book of collective poems, published through PublishAmeica, really captures those inner snap shot memories of what it was like then and now for those who were there. The poet was a combat medic and not some behind the frontlines desk jockey and when you read his poetry you make this journey with him emotionally. Some of his writings deal with his search for himself and for healing from the war. They are about recovery and hope and some will make you cry but some will bring a smile – it is all about the journey. This is one of the best collections of Vietnam era poetry in one volume by one poet! I have been many things over the past 57 years of my life. I have been a brother, son, friend, husband, father, soldier, medic, police officer, detective, letter carrier, college recruiter, grandfather, and now, poet. These poems are a reflective journey to find healing after the war in Vietnam. Thirty-five years ago I was a combat medic. When I came home, I was determined to put Vietnam behind me. Somehow, deep within my heart, soul, and spirit, Vietnam was a part of who and what I became. Finally, my journey to healing began, and these poems are the result of that journey, 35 years later. They will make you cry, laugh, and appreciate friendships. They are my road map to a place I call home. I only hope that other soldiers, medics, nurses, and doctors will be able to find a way to their home. So grab a beverage and curl up and join with me on the journey together as we find peace, hope, friendships, love and yes, even healing. I was enthralled by the stories that he presents about some of people and places that I know well. The book has its share of real heroes like Medal of Honor recipient Mike Novosel who flew air combat missions in 3 wars. I met Mike when he flew our Huey (old 091) from Fort Rucker to Florida during the first day of filming for the documentary, “In the Shadow of the Blade,” in October 2002. I was so honored to be onboard as a part of that crew. The man is almost a god in the world of helicopter aviation and Dorr does a great job capturing the events that lead to his being awarded that medal. There are no other books that I have read that covers such historic ground, as this book does, like the first helicopter rescues in WWII in Burma and Korea. Dorr shows us the evolutionary unfolding of how the helicopter was used for medical evacuations and for carrying troops. There is not a boring or dry chapter in “Chopper.” The interviews with old crew members, with their own insights and comments, add depth to the narrative. 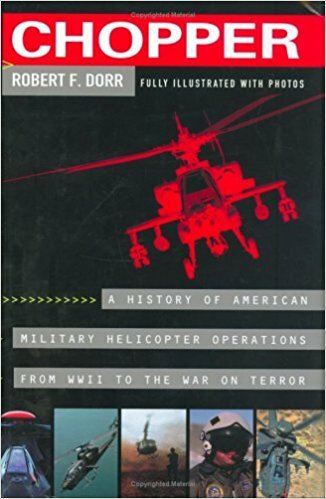 The book even mentions in passing, one of those small and heroic helicopter assault companies in Vietnam—The 128th Assault Helicopter Company (Better known as the Tomahawks and the Gunslingers). It also happens to be my old unit back in 1966 and 1967 so the author really had my attention. He also gets my appreciation for having included a mention of my old brothers. There are lots of photos and stories from all the modern day wars and actions. This is a great read for all readers. It is well worth buying and keeping this hardback book. There are none better of this genre! Real-life stories from the pilots and the passengers. From its first use in military operations, during a rescue mission behind enemy lines in 1944, to its crucial role in Vietnam, to the Black Hawk combat copters in the current war on terror, the helicopter changed the face of aviation-and the face of warfare. Whether they are bringing supplies and medical help or coming to the rescue of trapped soldiers, the modern battlefield could not function without them. This Book Does Mean Something! Author Susan O’ Neill offers us some sensitive and insightful glimpses of the Vietnam War from a women’s point of view in her book of short stories called, “Don’t Mean Nothing.” Each story takes you to emotional places of the heart and the mind in some of the finest prose that any novelist has used since Hemmingway wrote his great books many decades ago. Her female energy transcends all that macho testosterone of war and delivers story after story with both feeling and at times, some very profound thoughts. These stories use the nurses and hospitals and the war as a background but it is the power of each story that is what this book is all about. I was really touched after reading one particular one called “Prometheus Burned.” Being a macho guy, I will not admit publicly that I might have gotten some moist eyes, but I will admit that I was certainly moved by how she creates a mood and a certain poetic rhythm through her choice of phrasing. Her artistic use of some of the lyrics from that old spiritual song “Amazing Grace” really enhanced the emotional impact I was getting from this story. This book showcases the writing talents of Susan O’Neil. I am disappointed to learn that this is her only book in print to this date. She obviously has a gift that needs to be shared. This book will get inside your head and you may either become saddened, or inspired by her words of the spirit. She holds the reader’s hand like a nurse might in triage just before you have a bullet removed from your heart–this book is not for emotional sissies. It is mature, compassionate and at times boldly frank. It feels real and suggests to me that some of these experiences might reflect what the author may have experienced or felt herself in Vietnam, as a nurse so many long years ago. A must read! Do not get turned off by some of the harsh language in the Introduction; but go deeper inside the book’s pages and discover some real literary gold under an emotional and spiritual rainbow of words! Trust me on this—Susan O’Neill can write with any of the great ones! You will find it a worth while reading experience, even if it may emotionally hold you hostage for a while after you finally finish the book. It is a great book that may make you think, feel, and sense things about life, about war, and about people that may be new to you. That is the sign of a well written story and she has many to share. In this debut fiction collection--the first by a nurse who served in Viet Nam--Susan O'Neill offers a glimpse into the war from a female perspective. These stories are about women, and men, who served in three combat hospitals in 1969 and 1970. They are interconnected, peopled by one-time "stars" and recurring characters, and they deal both with both the minutia of everyday life in wartime, and grander, more over-reaching themes--love and loss, faith and despair, morality, futility, military idiosyncrasy, magic, and the cost to the soul of a year in war's very particular hell. The stories are purely fictional, yet based loosely on the author's experiences, and they are laced as liberally with black humor as with pathos. “Left for Dead” will inspire you! Vietnam veteran Jon Hovde teams up with Maureen Anderson to bring us a real life tale of heroes, redemption, sadness, suffering and joy! Jon’s life story “Left for Dead – A Second Life After Vietnam” will inspire you and it will also make you very aware of the sacrifices that many veterans have made on the personal level. This book tells it like it was and allows you to view a part of the veteran experience that mostly remains hidden from the public view. We find that Jon is very much a human being with all that baggage that comes from being a baby boomer growing up in the 1950’s and 1960’s. That includes his days spent driving fast cars and getting drunk. But his story takes us to new places of the heart and the spirit as we follow along on his personal journey through his life. We are there with him when his body is ravaged by war and his life is almost taken from him. Then we get an insider view of what it was like to recover and try to move on with his life. As a reader you will find yourself rooting for him as he begins his new life with a wife and family. The thing that will impress you most when reading this story is the author’s lack out anger or outrage at what the war did to him. He accepts life as it is and moves onward as best he can. Of course, with all that happened to him it is matter of time when he discovers that his workaholic attitude is killing him and that he needs to focus on his family and personal needs. He deals with many issues from PTSD to excessive drinking to depression but it is all just a part of the healing process for Jon as he continues to move spiritual and emotionally forward with his life. This book is riveting—once you read the first few pages you will not put it down until you have savored the final words on the last page. I know that is what happened to me. The book will inspire you as does his life to many people. Jon is a special person and is now doing much through his public speaking and now his book, to inspire and to help others. Jon Hovde's journey begins with despair and the struggle to stay alive and ends with hope and the inspiration to live. As a twenty-year-old soldier in Vietnam, Hovde lost an arm and a leg when the armored personnel carrier he was driving hit an antitank mine. He was nearly left for dead when the medic at the scene accidentally took his pulse in the arm that had been severed. For weeks, doctors gave Hovde very little chance of survival. When Hovde finally returned home, the transition was not easy. He used alcohol and fast cars to cope with both the physical pain of his injuries and the emotional pain caused by uneasy stares from his friends and neighbors. The straightforward words of a highway patrolman finally opened his eyes to his reckless behavior: "Why would a guy like you, who's survived all you survived, want to come back and kill yourself on our highway?" Hovde went on to marry his high school sweetheart, realize a successful business career, and become a leader of city and state school boards. In 1998, Hovde's war story found some closure when he successfully tracked down and was reunited with the nurse who had helped save his life. He was finally able to thank her. Left for Dead is a gripping memoir that not only recounts Hovde's remarkable recovery from his injuries, but recognizes the efforts of the people who aided him - including the courageous medic who rescued him, a caring army nurse, and army chaplains. Far more than just another tale of combat, Left for Dead will stir emotions in veterans, the families of veterans, and civilians alike. Hovde's lack of bitterness and abundance of hope is a source of inspiration to anyone overcoming obstacles. This is a great reading adventure for those who are seeking novels that deal with the Vietnam War in a slightly different fashion. First time author James Johnson, gives us an inside look at the men of that famous unit “The Wolfhounds.” He allows the reader to observe the mental and emotional states of these veterans through the eye of a fictional story and characters; however, it runs so close to the author’s and his former unit member’s actual experiences, that it gives the storyline a very high intensity impact. This is the best novel about the men who fought the ground war in Vietnam that I have read in the last 5 years. It captures the area, the sights, sounds, smells and feelings like an emotional digital camera. I flew most of my helicopter missions in this same area and time period where this story unfolds, so I had little trouble visualizing where he was at and what it was like. The descriptions and action come off as believable and real. Readers will be taken on an emotional ride. You will be changed in some way after reading this book. It will be difficult to forget some of the people and stories. Johnson uses great word and phrasing skills to capture the emotional and spiritual moments that his cast of characters goes through. “The Worm” refers to that mental process that slowly eats away at these combat veterans—eventually becoming infected with a bad case of PTSD! The book is given the MWSA highest rating. It is recommended reading for all mature age groups. The Vietnam Worm” is a collection of stories based on the actual experiences of the author and the men he served with. 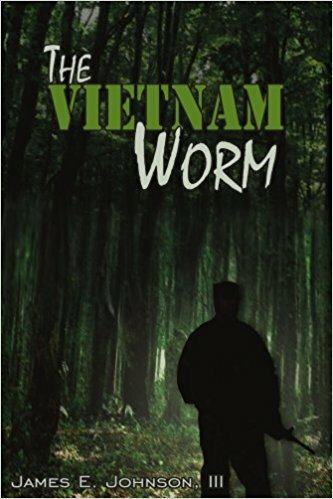 The central character is Sergeant Tom Danville, a man fighting not only the Vietcong, but the combat sickness, ‘The Worm’, that is slowly and secretly invading his brain. From cobras and man-eating tigers, to dealing with incompetent officers and booby traps, the book tells of the daily life ofDanville and his men as they strive to survive not only the horrors of war, but the transition of returning home to a country that neither appreciated nor understood the suffering and sacrifices they had made. The Vietnam War is all but forgotten now except by the thousands of men who were called and went, or volunteered because they truly believed it was the right thing to do. Many of these men still suffer now because they saw their duty and did it. A View Not Seen by Vietnam Veterans Before…. There are some books that are so important that they act as a kind of “rosette stone” for our understanding of historical events and the people who were caught up in them. This book is going to become a touchstone importance for those trying to relate to the human element of the Vietnam War for non-combatants. The author, Yung Krall, opens a new doorway to viewing what life was like for those families caught in up the cross fires of the Vietnam War. In her book, “A Thousand Tears Falling,” she will change and alter the thought processes of any veteran reading of her personal experiences. It will also enlighten those readers who were never a part of any war but often wondered what life was like for those who tried to live inside a war zone with their families. She puts a face on that war and on the enemy and on the allies. She, through her sometimes very sad story, will peel away some of the mystery of why certain members of a family, or a community in Vietnam, fought for which side. It is not as simple as one thinks. It has more to with personal loyalties, family and nationalism and less at times, to issues about communism or capitalism. Her father however, was a powerful leader in the war against the French, the South Vietnamese and the Americans and believed in communism. He left her loving home to go fight the war leaving behind his family to forge for them selves while he lived in the jungles and forests for 18 years. He was a NLF Senator and when the war was over he was rewarded with an ambassadorship. This book is all about family and loyalties and choices. There were many hard choices to be made in the author’s young life. She had to choose where her heart and loyalties really were at. She eventually worked for the South Vietnamese and American armies and ends up falling in love with an American navy pilot, getting married and moving to the United States. However, in order to get the rest of her family out of Vietnam to safety, she had to work with the CIA and became a spy. There is so much more depth to this story and what she had emotionally endured. I do not think a movie could do justice to it; only a TV mini-series could fully capture the spiritual impact of what her life was like and choices she was forced to make. This is one woman that you will want to meet in person and shake her hand. She has been through more than most could emotionally bear and she is the stronger for it. She will move you to tears at times when you read her book, but when you finish you will find that you have gained something valuable through that experience. In 1977, a woman called "Keyseat" arrived in Paris with 49 classified U.S. documents. Two days later, Hanoi representatives to the Paris Peace Talks possessed the documents, believing that Keyseat, whose father was a Viet Cong official, was their agent. In the United States in 1982, the Vietnam era's only convicted spies, antiwar activist David Truong and USIA officer Ronald Humphrey, were sentenced for document theft. The main U.S. witness was Keyseat, both a CIA and FBI agent. Yung (then Dung Krall) was Keyseat. Her memoir juxtaposes two phases of her unusual life: her early years in South Vietnam and her adult time as a U.S. Navy wife and career espionage agent. She also provides unique details of village and family customs, patiently describing her childhood, revealing the pain she suffered in a family split by ideology. Yung, anti-Communist from childhood, who shared her mother's views, was also a daughter of Dang Quang Minh, the Viet Cong's ambassador to the Soviet Union, whose life was threatened by his daughter's testimony. Yung led a fast-paced life that in its details rivals spy thriller fiction. A recommended first-person account for larger public collections. Margaret W. Norton, J. Sterling Morton H.S., Berwyn, Ill.
A Straight-forward Must Have Survival Book! Retired USAF Senior Master Sergeant and survivor expert Gary Benton has written the best outdoor guide for families – bar none, that I have read! “Simple Survival – A Family Outdoors Guide” is more than a book – it is an outdoor resource bible that every family should have a copy of. This is one of those books that you should have in your camping bag along with the tent and other equipment. However, reading it at home before you go off on some outdoor adventure would be a great help when potential situations happen. Benton has written many articles on survive that have appeared in magazines and on web pages across the globe – in this book he has taken all of his best advice that he has gathered over the years and put it altogether in one handy format. There is one chapter that deals with the greatest fears that all parents have – having your child get lost in the woods. This is a must read for parents. This information needs to be shared with all their children so they know what to do in the event of getting lost or separated from their parents or the campsite. This is the kind of information that you hope you never need to put into use – but if the situation does happen you will have increased the chances of a more positive outcome if everyone follows the suggestions for survival as outlined in that chapter. It is evident that Gary Benton knows what he is talking about. When you check on his training records you will find that he has graduated from some of the military’s best classes that included surviving in the Artic, water (Sea and Ocean), mountain, and jungle environments. He is the expert and you can trust your life on that! The MWSA book review committee found that this was the best book on survival skills and advice that they have reviewed. It is in a league of its own! Gary Benton has previously authored twelve books of fiction, non-fiction, and Southern humor. Such notable authors as, Matt Braun, Stephen Lodge, Don Bendell, actor James Drury and many others have endorsed his work. This survival book, "Simple Survival, a Family Outdoors Guide," is a Silver Award Winner from the Military Writers Society of America. Gary spent over 23 years on active duty in the United States Air Force and retired as a Senior Master Sergeant. Years of wilderness outdoor skills are in this book, along with survival tips. Learn survival so during the next natural disaster or terrorist attack you and your family can survive! Learn to survive with just a survival knife and a little survival gear, or with a survival kit. Survival is simple, using Gary's skills, and anyone can become a survivor! Take this book along during your next camping trip or use it when facing a real emergency and learn survival of the fittest! Survive the simple way, the Simple Survival way. Become a survivor! You will never read another book of poetry again like the one that Vietnam veteran poet, Dennis Maulsby has written. It is a work that defines the emotional essence of what the war felt like to those of us who served there. It reaches inside your skull and your heart and rips them apart with such visual imagery that it leaves you breathless at times, with your heart beating faster than it should be. But as you put down the written words, the inner verbiage still continues rolling around inside your head seeking comfort from wars and despair. But his poetry is much more than just war as it embraces the dreams of young soldiers who still have memories of good times at Myrtle Beach of 1968. Then he hits you with his poem, “Aging Warrior,” which takes you full circle emotionally and spiritually. These poems will create different reactions in the readers based on their own view of life and death and war — that is the magic of Maulsby’s poetry. It is much like a modern art painting subject to inner and very personal views of what is on the canvas; in this case, what he has on the printed page. Dennis Maulsby is no doubt one of the top 10 poets to come out of the Vietnam War era. His book is on the "MWSA Recommended Poetry Books List" to read for a good reason — it is a literary voyage that should be taken and experienced. so large pored and hairy. Blood-warm breeze felt so comfortable. so weary with the weight. A Muslim’s Conversion to Christianity - His Reasons Why Some people will find author Akef Tayem’s outlook on the differences and historic foundations of the three great religions (Christianity, Islam and the Jewish faiths) rather unique and thought provoking. 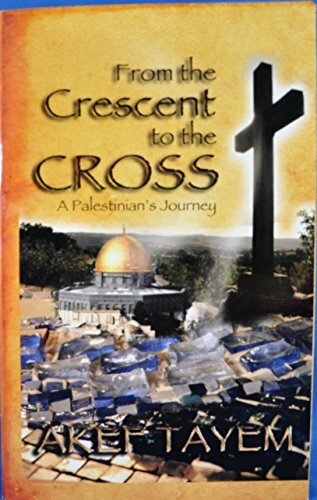 His book “A Muslim The Quran And Jesus The Son of Mary” (Subtitled : A Palestinians Journey from the Crescent to the Cross) is like nothing else out there in religious books. His comments and thoughts are the kind of thing that could put his own life at risk with certain groups in many places around the globe. He shows some courage in exploring the questions that he does in his book. His thinking and explorations of the holy texts from all three religions have caused him to rethink some of the fundamental things about his own historic spiritual roots. The book is full of references and notes to explain his thought process as he takes you along on an educational tour of his former Muslim beliefs and how he has evolved and became a Christian. This book is very scholarly written and the author does a good job of educating the reader and presenting his views. He is full of passion and energy as he tackles what he sees as fabricated stories and mistaken beliefs about the missing Gospel that Jesus was given. This book will give the reader a better understanding of not only the differences between the religions but also an awareness that they are all from the same basic foundation. This is not a book that would be considered light reading but if you had the time and were looking for more understanding about what is going on in the world today based on what people are being taught and what they are lead to believe. Reviewer: W. H. McDonald, Jr. This book captures the historic lives of many wonderful women who served this country in various roles including some in combat zones. Her bios of women, who’s service spans a time from WWII through the present time, highlights stories and events that have not been told in this public way before. Her book breaks new ground as it shares personal memories that normally are only communicated between immediate family members. Although the majority of the stories focus on those women in military uniform, it also deals with volunteers who served their country in other ways. Every story is a gem in a treasure chest of pure history. There is so much love in this book for the women profiled. You can see and feel the care that the author gives to each woman’s story. The author does not try to paint all these women as heroes, although many really are in the truest sense of that word, but as real people who made personal sacrifices for their country. Some of these women have also paid a physical and psychological price for their service. This book attempts to recognize their efforts and their many achievements. This book is well written and lays to rest that old rumor that the author was actually born in a military footlocker! Noonie has a way with her words; making every story feel like you are sitting down with each women in her home to listen to their personal tales in person. The book breaks into many short little chapters that make it a delight to read for people who have small blocks of time – like lunch time or between other life events. It is a book that will become a classic on women’s history. 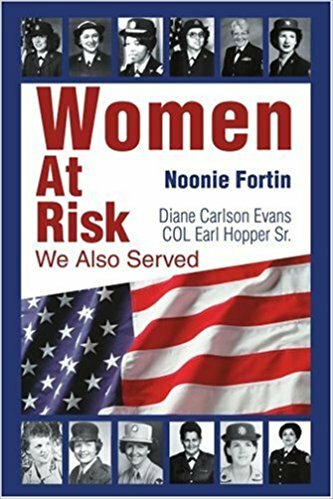 Women At Risk: We Also Served is about women who served our country since before World War II to present day. All branches of the military are included, officers and enlisted personnel, as well as women who volunteered as civilians going to a war zone, those that stayed stateside, and other loved ones. Included are clerks, drivers, heavy equipment operators, nurses, USO and ARC volunteers, and more. These women explain some of the things they did or do in the military or as civilians. They tell us why they volunteered, how their lives were changed, and answer the question, Would I do it again? More than sixty women are profiled in this book. Their stories are finally being shared many for the first time.This book is for readers of all ages including students. It will encourage patriotism as you read each chapter. They encourage both the reader and listener to talk more and ask questions about their own family military background. Noonie Fortin realized there was a need for this type of book each time she entered a bookstore and couldn't find very many books about women who served their country. A B-29 Aircraft Crewmember’s Eye Witness View of History. I picked up “Fire From The Sky” and was just going to look take a casual stroll through the first few pages to see what it was about—but I got hooked on the reading of the air battles over Japan and of the men who flew these missions. The authors make great use of Herbert Greer’s personal diary that he kept during those dangerous and historic flights. You get some wonderful insights and not just facts and data about what happened. You read about the fears and feelings of the real men and what it was like to be a member of a B-29 Bomber crew. The diary they use to set up the storyline of the book deals with more than just the 28 air combat missions that Greer flew over Japan as a radio operator. We get a little glimpse about his early life before his service; as a youth on the farm and to being involved with the construction of the Grand Coulee Dam. However, it is the riveting stories of those fire bombing missions of Japan’s largest cities that becomes spell binding. The authors make great use of the actual diary entries along with comments and thoughts from the now much older Greer to make you feel like you are a part of the flight crew. The reader will begin to feel and almost experience their emotions, as the stories of their missions unfold. These men took great risks and put their own personal lives on the line for their country; this book captures this piece of history, preserving it for future generations. Even though these men were all heroes; they were not supermen of any kind but regular flesh and blood men who did some very astonishing things in their young lives. They really did help to end the war with Japan. This is a book you will not be able to put down until you are done. It is a well told memoir of the men whose missions will live forever in history! Meeting them in this book is a cherished privilege for the reader. It was my honor to have read the book; it felt almost sacred to be allowed to look inside a crew member’s personal diary—truly a treasured artifact of historic and sentimental value. This is a book worth reading several times. Great black and white photos as well. I fully recommend buying and reading this wonderful book about aviation and the men who crewed B-29s. "May 26, 1945 target Tokyo; the target was the eastern part of the industrial section of Tokyo. It was hot as hell too, because the Japanese were waiting for us. We went into the target individually and as we made our sweep, one Jap twin-engine fighter was waiting about 20 miles off the coast and followed us over the target. Flak was very heavy and searchlights were estimated at about 400 in number in the Tokyo area. We were in the searchlights all the way through the target. Losses were estimated to be about 18 B-29's. One crew came back with the tail almost shot off and the tail gunner had been killed instantly. On both raids the industrial centers we hit had an estimated civilian population of 50,000 to 75,000 people per square mile area. Fires started by the incendiary bombs covered 10 square miles and could be seen 200 miles out to sea." If this dialog sounds like a plot from a war movie it well could be, however the account consists of the bombing mission quotes taken directly from the diary of S/Sgt Herb Greer, Radio operator on a B-29 Superfortress named the "City of Monroe" during the war with Japan. The diary takes each of the 28 missions flown by the B-29 "City of Monroe" one by one and details those events as they happened over Japan. The accounts are filled with such phrases as "Great Fires, clouds of thick black smoke, horrific smells meaning flesh burning, which permeated the aircraft over the target area and lingered until they landed some 8 to 10 hours later on Guam. Bombing missions were repeated until most of the industrial areas of Japans major cities were nothing but ashes. The final days were approaching when Hiroshima and Nagasaki would be devastated with the two atomic bombs. The gentleman that I speak of is my father, Herbert L. Greer and this is a book of his diary, supplemental comments and pictures that reflect on a period of time that the United States freedom and liberty were highly at risk.